Contested lands • Environmentalists also say Bush-era plans reserve too much for oil, gas. 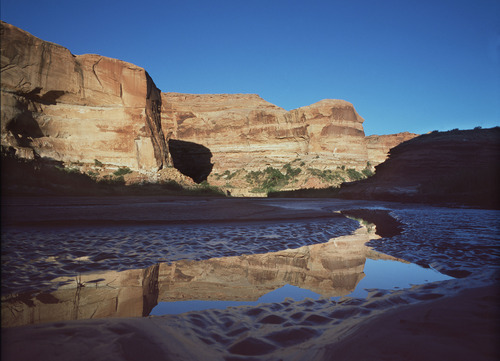 Al Hartmann | The Salt Lake Tribune Cliffs reflected in the Dirty Devil River. 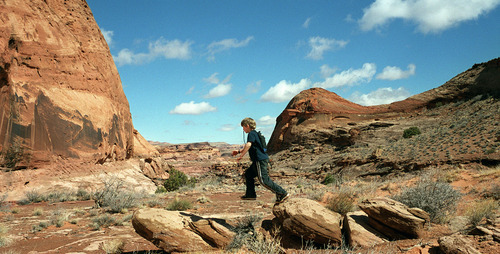 Al Hartmann | The Salt Lake Tribune Hikers make their way across slickrock to the Dirty Devil River. Al Hartmann | The Salt Lake Tribune Young hiker jumps rocks in a side canyon of the Dirty Devil River Canyon. Al Hartmann | The Salt Lake Tribune Factory Butte on the southern end of the San Rafael Reef as seen near Hanksville is on the Southern Utah Wilderness Alliance list of Utah's ten most threatened wilderness treasures. The group alleges a BLM land-use plan could turn some of this area into a motorized play ground. Al Hartmann | The Salt Lake Tribune Dirty Devil River Canyon. 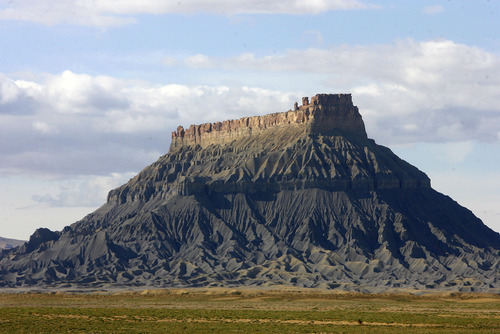 Al Hartmann | The Salt Lake Tribune Factory Butte on the southern end of the San Rafael Reef as seen near Hanksville is on the Southern Utah Wilderness Alliance list of Utah's ten most threatened wilderness treasures. The group alleges a BLM land-use plan could turn some of this area into a motorized play ground. BLM&apos;s planning document for a vast swath of federal land in central Utah authorizes motorized access on a 4,277-mile "spider web," including traffic on roadless areas, conservationists allege in their latest legal salvo attacking six land-use plans approved during the waning months of the Bush administration. 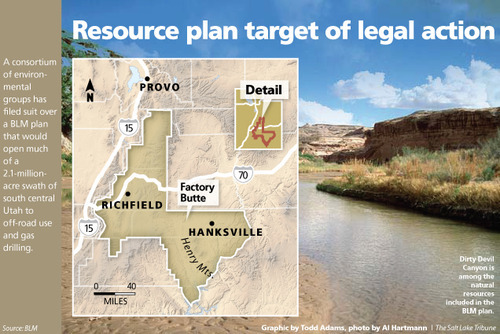 The Richfield resource management plan, or RMP, also reserves too much land for oil and gas at the expense of endangered species, archaeological sites, air quality, sensitive desert landscapes and quiet recreation, according to a brief filed last week by a consortium led by the Southern Utah Wilderness Alliance. Environmentalists blast the Bureau of Land Management&apos;s Richfield plan as an "unbalanced" insult to the multiple-use concept, allowing motorized use on 90 percent and energy development on 80 percent of the resource area&apos;s 2.1 million acres, according to SUWA attorney Steve Bloch. "These are amazing iconic landscapes. These plans not only guide future decisions for 15 to 20 years, but the BLM also approved an off-road plan which immediately authorized vehicles on the ground where there is no trail," Bloch said. The plan even designates motorized routes through Wilderness Study Areas and other inventoried roadless areas, SUWA contends. Because the RMP disputes are the subject of pending litigation, a BLM spokeswoman declined comment. The travel plan allows "parking and staging" for up to 50 feet on both sides of designated routes and on "existing spurs," and off-route travel up to 150 feet to campsites. The route network crosses streams in 400 places. Land managers violated several land-use planning and environmental protection statutes by failing to determine how motorized recreation and drilling could degrade the many natural and cultural values associated with the canyons and badlands east of Capitol Reef National Park, alleges the brief Bloch filed in federal court on behalf of SUWA, the Utah Rivers Council, the National Parks Conservation Association, the National Trust for Historic Preservation and other groups. 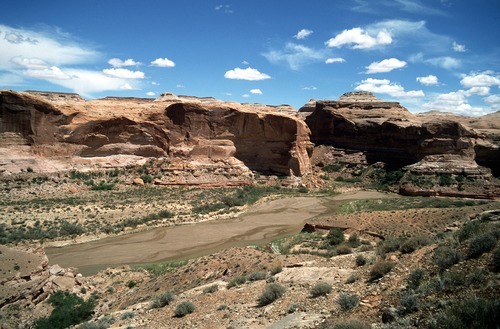 In the fall of 2008, the Department of Interior approved six long-range planning documents covering 11 million acres under Utah&apos;s Richfield, Moab, Monticello, Kanab, Vernal and Price field offices. At the time, they were broadly panned for failing to protect some of Utah&apos;s signature landscapes, from the 11,000-foot-high Henry Mountains to Nine Mile Canyon. Critics also saw these land-use plans as an attempt by the Bush administration to lock in pro-development policies on the eve of a presidential transition. After four years of protests and litigation, the challenges have landed in the Salt Lake City courtroom of Dale Kimball, who has picked the Richfield dispute as the lead case. This plan features issues of law and fact that are common to all six, so it is hoped that a resolution on Richfield will help resolve the others. Largely drained by the Dirty Devil River and its labyrinth of tributaries, the Richfield resource area covers much of Sanpete, Sevier, Piute, Wayne and Garfield counties  including 3 million acres of subsurface mineral estate. About half of BLM&apos;s holdings harbor wilderness attributes, yet the agency designated only 0.3 percent of these lands, or 2,530 acres, as areas of critical environmental concern, SUWA notes. In earlier filings, the BLM said "standard management" provides adequate protection for the remaining 97.7 percent. The BLM identified 150 stream miles that could qualify for Wild and Scenic River protection, but the plan nominates only a five-mile stretch of the Fremont through Fremont Gorge. 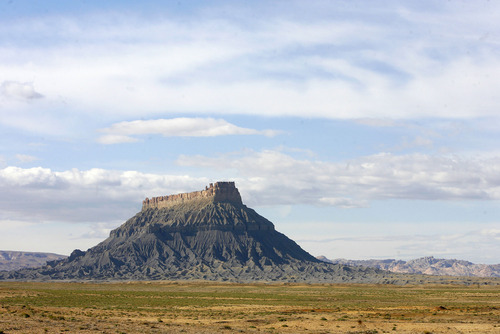 Conservationists were particularly dismayed that the plan reopens Factory Butte, a scenic badlands of wind-sculpted Mancos Shale formation, to motorized travel. BLM had closed this area to protect endangered Wright fishhook cactus and the threatened Winkler cactus. Without providing much rationale, the new travel plan allows dirt bikes and four-wheelers back in, even though the threat to the cactus species has not been eliminated, alleges the SUWA brief.